The U.S. government says it doesn’t have a problem with North Korean satellites in space, just as long as they aren’t launched on North Korean rockets. That distinction could be important in coming months as North Korea moves towards attempting to put a second satellite into space. When North Korea last launched a satellite in December 2012, it ended up attracting additional sanctions from the U.N. Security Council because it was judged to be in violation of an existing U.N. resolution that banned North Korea from conducting missile tests. While not a missile, the Unha-3 rocket is suspected of using almost identical technology and so the launches are said by critics to be nothing more than missile tests in disguise. There hasn’t been a launch for more than two years, but a North Korean official told the Associated Press earlier this month that it’s planning to place a further satellite into orbit. That announcement was met with a frosty reception in Washington. “Any rocket capable of placing an object in orbit is directly relevant to the development of long-range ballistic missiles, as many ballistic missile and space launch vehicle technologies are virtually identical and interchangeable,” said State Dept. spokeswoman Marie Harf during a briefing on June 4. “So we’ll be watching this. It could very likely contravene U.N. Security Council resolutions,” she said. At the time, the question wasn’t answered, but on Monday a State Department spokesperson told North Korea Tech that a North Korean satellite itself isn’t its concern. 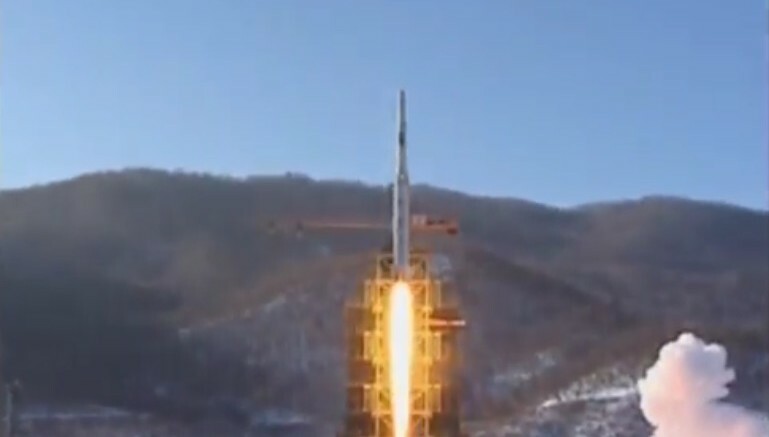 Other countries are not prohibited from launching North Korean satellites, as long as the launches are carried out in accordance with international law, including the obligations in U.N. Security Council resolutions, the spokesperson said. North Korea has been unusually happy to follow international law when it comes to mechanics of its satellite launches. It’s made sure to signal each launch attempt to the International Maritime Organization and International Civil Aviation Organization so ships and aircraft can be kept at a safe distance and, after the 2012 launch resulted in success, it registered its satellite with the United Nations. All of that allows it to say it’s being treated unfairly, because it’s simply doing what neighboring countries do. On Saturday, it said as much in an article carried on the state-run Korea Central News Agency. “The DPRK’s satellite launch for peaceful purposes is inviolable as it is an exercise of a legitimate independent right of a sovereign state publicly recognized by international law, which is above UNSC resolutions,” the article read in part. But that argument doesn’t address the U.N. Security Council resolutions. It’s also a fairly easy distinction for the U.S. to make. With the cost of a satellite launch in the tens of millions of dollars, it’s not something North Korea can really afford anyway. 1 Comment on "US would be OK with a North Korean satellite, but not a launch"
I think the Kim regime for once is actually being honest with their intentions here. I think they do want to develop a legitimate space program for the prestige factor it provides Kim Jong-un. One of Kim’s major efforts has been pushing technology upgrades in North Korea which a successful space program would be the crown jewel of this effort. Especially if the regime is able to show more success than the ROK or at least get their people to believe they are having more success than the ROK. That is why I believe they have been working so hard to follow international protocols for launches in an effort to get the UN resolution modified to allow space launches.